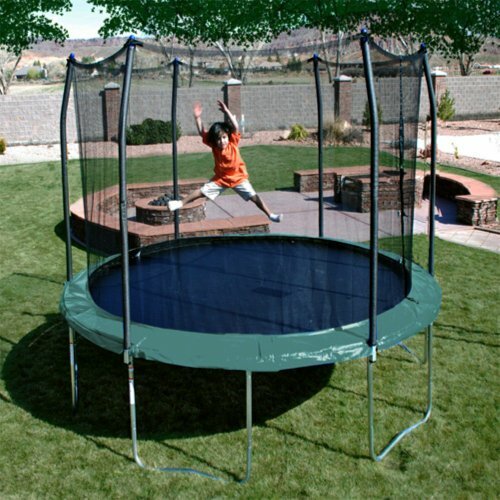 Bring bouncing fun to your own backyard with Skywalker Trampolines 12 ft. round trampoline with enclosure. This trampoline is a great size for all jumpers and with innovative safety features and a heavy galvanized steel frame your family will have years of safe and fun jumping. Reinforced welded T-sockets secure the enclosure frame to the trampoline frame eliminating structural twisting. Total of 6 W-shaped legs provide added bouncing stability. The Stay-Put enclosure net design uses a button-hole feature interlocking the enclosure netting directly to the jump mat away from the springs and frame creating a gap free jumping environment with no ropes to thread. The arched enclosure frame suspends the enclosure netting away from the frame and is padded with soft foam for added protection. All materials are made with quality UV resistant materials for added durability.